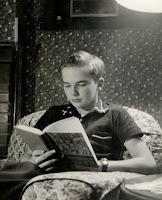 THIS young man is not the audience for my newly completed novel, CALLING MR LONELY HEARTS! I’m pleased to say that I just today submitted the manuscript of CALLING MR LONELY HEARTS to Ballantine. The scheduled release is Spring 2009. It seems like a very long time to wait. When I finished writing ISABELLA MOON, it was all so darned hypothetical. I felt an immense sense of accomplishment, but no one (except my darling, long-suffering agent) was waiting for it. Pinckney didn’t even read it (until publication). My editorial audience was hypothetical, too. While it wasn’t quite a lark to spend a year writing IM, it was certainly a gamble. Now begins the long editorial process for CMLH. Many folks will read it and give me their input. There will be cover art and ARCs and media kits. Also lots and lots of copyediting memos. I really rather enjoy those. I’ll keep you posted on the process. What’s it about? Here’s my pithy log line: A former priest enlists the aid of demons to take revenge on the three women who ruined his life and career. How’s that for a story? I think you’ll like it if you like your fiction dark, intense, and thrilling. But it’s definitely for grown-ups, only! Off to do a little celebrating! Wow! It does sound great! Congratulations on another completed manuscript! Now I’m just waiting to hear what my editor thinks! You go! Congrats, Laura, sounds like my kind of book! Wow! Such exciting news! Congratulations on your excellent accomplishment!